Our Peoria, AZ Medical Weight Loss Clinic in the West Valley is conveniently located at 79th Ave and Thunderbird Rd. We are always ready to help and assist you with any of your weight loss needs. And while no appointment is necessary, we do recommend calling us in advance so we can meet you needs immediately. 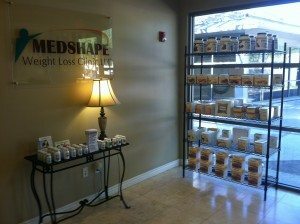 Medshape has been in the business since 2007 and staffed with highly-trained medical weight loss team of doctors, nurses and medical assistants who have helped thousands of clients achieve their weight loss goals. You may have tried other weight loss programs in the past. Experience yourself why Medshape Weight Loss Clinic is a cut above the rest. We believe you owe it to be treated individually, based on your personal struggles with weight and what your desires are to accomplish. We base your medical weight loss treatment based on you and your needs. Stop in today!